If you’ve read last month’s post in this series and/or my previous post on reading aloud to the elderly, you’ll know that I’m a strong advocate for reading aloud to elderly people, whether they are in their own home or in a nursing home. Once we decide that we want to try out reading aloud to the elderly person/people in our lives, what do we read? What are the person’s interests? Are they still able to read for themselves, but find some things too difficult, either because of the weight of the book or the size of the print? What is their cognitive level? People with dementia often can’t follow a story the way they used to. It’s important to note that even without dementia, the aging brain can’t always comprehend things as quickly as before. Carolyn Banks, who wrote the article in the Lancet that I quoted last month, stresses that it’s best to choose reading material that isn’t too long. Elderly people often have a shortened attention span, or may find it difficult to concentrate on listening for long periods of time. She, along with a colleague, Janis Rizzo, commissioned and curated a collection of short stories specifically for the purpose. Look for A Loving Voice: A Caregiver’s Book of Read-Aloud Stories for the Elderly and its companion volume, A Loving Voice II. I would also suggest magazine or newspaper articles that relate to the person’s interests, stories about life in the years when the person was growing up, local history books that will bring old friends to mind, letters that they’ve not been able to read themselves… there are many possibilities. I’d also emphasize the importance of asking the person what they would like to hear! Having autonomy in some decision-making, including what they read or have read to them, is important at a time in life when much autonomy is taken away. One of my readers last month asked specifically for suggestions for reading material that children could share with elderly people. 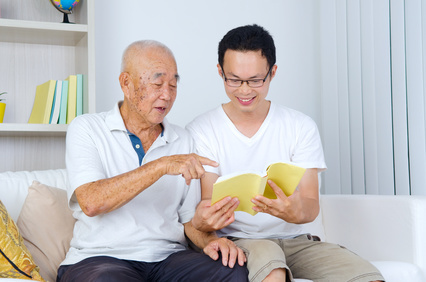 Reading stories that bring to mind the elderly person’s childhood could be great conversation-openers between the generations, and might bring out stories of the person’s past that haven’t been told (or that bear repeating). My aunt, Myra Stilborn, wrote a couple of books that have stories and/or poems that would be great in this context. For this purpose, I particularly recommend her Whippletrees or Don’t Take Any Wooden Nickels. Myra’s books are available on iTunes, so the child would need to have a laptop, tablet, or other device from which to read, but that might be a great conversation-starter in itself! I’m sure there are many other such books, perhaps by authors local to your area. One of my other readers said that her mother had greatly enjoyed hearing Old Yeller read to her by one of her grandchildren. I assume this reading took place over a series of visits. That suggested to me the possibility of asking the person what books they particularly liked when they were the child’s age, and if the books are still available, they could be the ones the child reads. This could also be a great way to connect the generations in conversation. One thing I’d suggest keeping in mind, and explaining to kids who want to read to elderly people, is that the person might not remember from visit to visit just what was read last time. It would be a good idea for the child to practice a preamble such as “Last time, Anne Shirley and Diana Barry were getting ready to go to school after the summer holidays.” That will help the child keep track of the story as well as giving the elderly person something to latch onto. Also, a reminder to children and adults alike – elderly people’s hearing is often not very good anymore, so clear enunciation, a slower pace than usual, and speaking up (without yelling) are crucial. I hope that these ideas will help get you started. Come back next month for a post on HOW to read aloud to the elderly. Do you have further suggestions of potential sources of reading material? My New Flubs2Fixes Website is Up and Running! Creativity: Costumes, Challenges, Coloring and Contests! Some great suggestions Beth. Yes, Old Yeller was read to Mom over a series of visits. I was touched when I heard that my mom and my granddaughter cried together at the end. A nice bonding activity. This is such thoughtful and important information. Glad you’re doing this series. I learned a lot. I particularly like the idea of children wanting to read to the elderly. There is always such a connection between young and old. I would think that kids could read/share something they love. Just returned from a lengthy vacation and am catching up. These are great suggestions. My mother reads to patients at the nursing home. She has always been a care-giver for the elderly. She’s getting up there herself, now, but still so thoughtful, and she’s a great out loud reader. I believe that people of any age enjoy that soothing feeling of being read to. I used to read to my high school students in English class. They started to ask for it, especially when we were starting a novel. It was the most attentive, and quiet, they ever were for me!